It is argued that monogamy isn’t biologically possible and today we will be keeping this theory in mind as we talk about how each Zodiac sign cheats in their relationships. 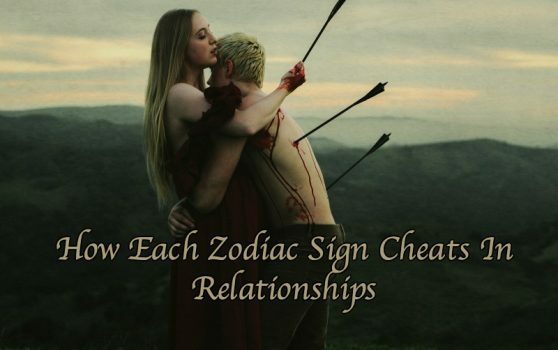 Now, it isn’t necessary that everybody cheats, here, we are trying to convey the ways in which zodiac signs cheat, if they ever do end up cheating. Being of a carefree/careless nature, for Capricorns, cheating is not a big deal. They will not regret cheating and they will not care how their actions have affected another person. They are also clever at anticipating your possible moves which is why they won’t be caught for a long time. And when they are caught, sooner or later, they will either try to justify their horrible action or they will pretend to be apologetic. However, in their defense, Capricorns are physical cheaters and not emotional ones. Maybe their love for you is not a lie; maybe all they wanted was some physical thrill. In their minds, they only took a break from the long-term relationship they are in which they greatly justify to be not so immoral. From the point of view of a person who lives by strict rules, Capricorns cheat with ease and without regret which is not the ideal lifestyle to be adopted by any zodiac sign whatsoever. Capricorns can be brutally guilt proof. Aquarius cheaters, on the other hand, are emotional cheaters. They get attached too soon and end up falling for the person that is not their partner. They are like those kids who just cannot be happy with one candy and cry to get a new one every time they pass by the store. And quite literally, their conscience is not mature enough to stop them from drifting away every time. Although cheating can be considered a moral flaw, some people like to refer to it as a weakness. Also, they will actually want you to find out that they have been sneaking behind your back. They want to be found out not because they are hurting you, but because they hate the stress. So even here, they are being selfish. Aquarius cheaters cheat because they love new and shiny things. However, the circle goes on and on because they are never really satisfied with their conquests. Pisces are very clever individuals who are able to get away with anything using their elaborate scheming. Due to their cleverness, they usually never get caught before it’s too late. They are like robbers whose robberies are planned, but like no crime is perfect, theirs is not either. Pisces cheaters do get caught but take their time and keep the victim in the dark for long. They make their victims feel like they are the only one for them. So, if any Pisces is a cheater, he/she will be a manipulative and selfish person to the partner. Their cheating tactics are just as good as their loving tactics. One minute they will be telling you how much they love you and the next, they will be out drinking coconut water with the side-date. Being of an adventurous nature, Aries cannot help but cheat on their partners. They like to move around generally and the people they meet while constantly move around become their guilty pleasures. The worst part is that they won’t even deny it; instead, they will blame the victim. They blame the victim to ease their own subconscious guilt and to justify their actions to their own selves; that is how they are able to walk around with a guilt-free conscience. Aries individuals also have strong defense mechanisms which help them in justifying the cheating behavior. As long as they believe that they did it for a reason, no one make them think or believe otherwise. They are all about exploring life and that cheat or cheats are a part of their exploring the world. Taurus individuals are loyal and they almost never cheat. However, if a Taurus ends up cheating on you, it probably means that he or she fell in love with someone else. If they do cheat on you, there is no hope left because they genuinely love this person and won’t be leaving them ever. You were probably someone they thought they love but didn’t. It can be pretty hard to be cheated on by a Taurus because they are true and sensual lovers. When they stop loving you or find someone they love more than you, it can be really difficult to deal with the pain. They make a relationship worthwhile and losing all of it to another person can potentially break you. Taurus cheaters do feel regret. Gemini usually cheats on their partners with those who are in close proximity to them. Yes, most clichéd “he cheated on me with my best friend” cases involve Gemini on the giving end. They target those who are in your close circle. If you’re having a party at your house, chances are that your Gemini is lusting over all of your close friends and acquaintances. They have a hard time controlling their sloppily slippery eyes and hearts. Due to them dating from your social circle, chances are that the way your Gemini will get caught is, if you catch them during the act. And you know what? You probably will catch them in the act. They are likely to embarrass you in front of your acquaintances or family or friends. As far as regret is concerned, they will get upset on you leaving them. They are of those kind who do not believe in monogamy and although they might keep this belief a secret, their actions will speak. Being of a simple and uncomplicated nature, cancers are really bad at cheating. They just don’t know how to cheat and that is why, they get caught right away. They are sensitive and loving people who are always in search of the right person but, at the same time, they are afraid of breaking your heart. They will either inform you right away about their feelings for someone else or get really anxious trying to keep the news inside. They will regret loving someone other than you because of how it will hurt you. They will try to tell you in a subtle way but their subtle way gives you a clear indication that your Aries partner has been cheating on you. The reason behind their cheating habits is the fact that Cancers are always looking for a special person who would complete them. So, they will keep cheating until and unless they find that person. Make sure someone knows how to love a Cancer. You eventually own up to your heartache and emerge from the experience a more broken person. Leos don’t really cheat not because they are loyal, but because they hate the drama that is associated with cheating. They cherish their peace and comfort beyond all and would have no problem sleeping with one person for the rest of their lives as long as they are at peace. They find it easy to love just one person for all of their loves because of all the comfort and all the perks it brings along. They are somewhat too lazy to take all the drama which is why they also find it easy to ward off any feelings growing inside them for someone other than their partner. To a Leo, cheating makes no sense. It just brings unneeded complication to their lives and disrupts the peace that they have worked so hard to attain. To them, peace holds much more value than intimacy and that is their key to a happy relationship. Virgos are masters at cheating. They can keep the cheating going on pretty much for the rest of their lives without their partners ever finding out. They pre-plan everything by imagining every possible scenario of them getting caught. They are very efficient liars which also makes it easy for them to catch a liar. If a Virgo is cheating on you, there is no way in hell you will find out about it unless he or she tells you. Virgos are also known to keep at least one backup with whom they’re emotionally attached. So, while dating a Virgo, be careful and be very cautious whenever their habits start to change. Chances are that you will never be able to detect any changes because they are such good liars but keeping an open mind does no harm. Virgos can love you and three other people at the same time without ever letting you feel ignored. Although not many Virgos take up the trouble to love more than one person due to their serious attitude in life, it is possible just as much. Libras have mastered the art of deception. They can date two or more people for an indefinite amount of time without anything getting suspicious. They keep multiple backups even if they do get caught. Libras are also very good at convincing people into doing what they don’t really want to. The aforementioned traits make them dangerous cheaters. Their philosophy of life is pretty straight; everything happens for a reason and one has got to what he has got to do. They don’t usually take complete responsibility of their actions and only realize later how badly they have messed things up for themselves and their partner. Scorpio cannot really cheat on their partners because they take relationships very seriously. However, people can cheat on their partners with Scorpio because they fall in love very easily and are blinded by it. Due to this reason, they can never be the cheaters but can be the victims of cheating and being used. Once in, they only get out when they are forced to. Scorpios cheat rarely and when they do, they do feel bad about it. Being easy to fall in love themselves, they know how it feels to lose a loved one and understand the pain, which is also why they refrain from cheating. They are also honest about cheating when they do cheat. For Sagittarius, cheating is a game and they love to play it. They jump from one opportunity to the next and, in most cases, they always have a few dates lined up already. In fact, that is the only time they have fun with their lives. Sagittarius people are hard-working and in order to blow off steam, they date and cheat. They feel no difficulty in having ‘the talk’ with their partner and finding someone new just a few weeks later. They are the ultimate playboys. They feel everything very intensely except for love; tension and stress gets to them which they cure by changing partners frequently. They know that it is not the right lifestyle and try to settle but they just cannot help it when it goes wrong. Sagittarius cheaters are capable of feeling regret.